I have had my Tennant Suit for about a month now and I've been waiting to write this review until after I had field tested it. 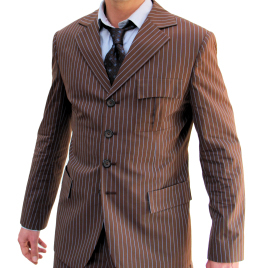 I bought this suit for a local convention I have attended for many years and since I am such a huge fan of Doctor Who, this suit was a must. I wasn't quite sure what to expect when it first arrived in the mail. I had done the measurements myself so there was some room for error, but Indy was very patient with me and my e-mails asking if I had done them right. I also asked if it could be shipped to me before a certain date, and I am pleased to say it arrived quite a bit before that. When I opened that box and saw this thing, I'll admit to being completely and utterly blown away! Even better than just touching this thing was wearing it, and let me tell you it fits likes a dream! Especially the pants, I have never had a pair of pants fit me so well. The armpits were a bit tighter than I had hoped for, but that was my own fault. Everything else about this suit is perfect, down to the last detail! I have gotten more compliments and questions about it at this year's convention than I can count! Thank you Magnoli for making one of the most beautiful and amazing works of art this fanboy could ever hope to wear. I highly reccomend this suit to ANYONE reading this review, you will NOT be disapointed!